James Harper Harris (b. 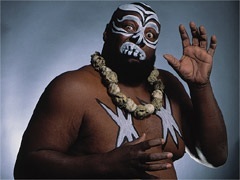 1950) is a retired American Professional Wrestler from Senatobia, MS, who is best known for his work in the 1980s and 1990s as Kamala the Ugandan Giant. The Gimmick was of an Ugandan "savage." He competed primarily in Memphis, in World Class Championship Wrestling in Dallas, Texas, in Mid-South Wrestling (Louisiana/Oklahoma), in the American Wrestling Association and for WWE. He made his PPV debut at SummerSlam 92 against The Undertaker. He was a four-time USWA (Memphis) Unified World Heavyweight Champion . His last run with a major promotion was as a member of the Dungeon of Doom in WCW from June through October 1995. He also competed for All Japan Pro Wrestling, Juggalo Championship Wrestling, various National Wrestling Alliance territories, W*ING, Ring of Honor and many independent promotions, including defeating Ring Of Honor/CHIKARA regular "Sweet N Sour" Larry Sweeney at a Women Superstars Uncensored event, WSU Ultimate Impact Phase 2 on May 18, 2007, when the promotion was still known as Wrestling Superstars Uncensored. He was inducted into the Texas Wrestling Hall of Fame in 2012. He is one of the wrestlers who holds the distinction of having slammed André the Giant before Hulk Hogan did it at Wrestlemania 3. As usual, the basics about his career can be found at The Other Wiki . Acrofatic: At his best. His speed and agility were often acknowledged by commentators during the 1980s. He was usually over 400+ lbs. and regularly came off of the top rope. Blade on a Stick: Always carried a spear to the ring. The Cameo: Went to a double-DQ with Ring of Honor World Heavyweight Champion Bryan Danielson at a Liberty States Wrestling (now NWA On Fire) show in Bridgeport, CT on September 30, 2006. Celebrity Resemblance: Of late, a lot of people online have been comparing him to rapper Rick Ross. Choke Holds/Neck Lift: A regular feature of his matches. He actually did an early two-handed prototype of the chokeslam for years before the move was officially named in the U.S.note The regular chokeslam was invented by former Sumo wrestler Hiroshi Wajima. Death from Above: He usually weighed in at over 400 lbs. and, for a time, would come off the top rope. Dented Iron: See Downer Ending below. Do Not Adjust Your Set: While doing commentary for an early Kamala match in WWE, Vince McMahon said, "Ladies and gentlemen, don't adjust your television sets!! This is KAMALA!!" Does Not Like Shoes: In character, at the very least; he wrestled barefoot. Downer Ending: Forced to retire in November 2011 due to having one of his legs amputated because of diabetes. In April 2012, his right leg was amputated. Drugs Are Bad: In his song "Push It" (see below under Take That! ), he explains that he never used steroids because he didn't want to mess up his body, adding "What might work for you might not work for me." Unfortunately, he messed his body up in another way. Dumb Muscle: Tried to pin guys when they were face down, leg hook and all. Establishing Character Moment: Introduced to WWE on its USA Network talk show Tuesday Night Titans in 1984 in an interview with manager "Classy" Freddie Blassie and his handler Fridaynote The gimmick was later renamed Kim Chee when Kamala returned in 1987, though Steve Lombardi was not in the mask at this point.. Blassie had brought a cage with a live chicken in it and said that it was time "for the chicken to do a disappearing act. He's going to eat him alive!," with host Vince McMahon saying "No! No! No!" as Friday opened the cage and Kamala reached for the chicken. Cut to Kamala still sitting on the couch with feathers around his mouth and a completely insane look in his eyes. Expy: According to JJ Dillon , Lawler had done a guest shot in Florida against Dillon's Japanese heel Kendo Nagasaki, giving Lawler the idea to create his own face-painted "foreign" monster, leading him to turn Harris, then a struggling jobber, into Kamala. Later spawned several copies, most famously Giant Kamala II, real name Ben Peacock, aka Uganda, the Botswana Beast and Atkie Malumba, best known for his work for All Japan Pro Wrestling. Finishing Move: Big Splash, top rope splash, splash onto opponent's back. Foreign Wrestling Heel: In his very early days as The Mississippi Mauler, he was an evil American wrestling in Great Britain. The Giant: It was part of his name, after all, though he barely qualified height-wise (being billed as 6'7"). Heel: After winning his match against Motoshi Ohkuma that is described on the Awesome page, he was walking to the back when a fan tried reaching out and touching his hand and he reacted with surprise. Monster Heel/Foreign Wrestling Heel: One of the best of his era. HeelFace Turn: Split from manager Harvey Wippleman and Kim Chee (Steve "Brooklyn Brawler" Lombardi under a mask) in late 1992/early 1993 and sided with Reverend Slick, who told Kamala "You are a man!" and tried to teach him to bowl. I'm a Humanitarian: Implied in the gimmick's early years. Kick Dude: Back kicks were regular features of his matches. No-Sell: In his match with Yokozuna on the May 17, 1993 Raw, they did the big collision spot, and, even though Yoko was fatter, wider and outweighed Kamala by probably around 100 lbs. or so at the time, Yoko looked to be on the verge of falling over while Kamala wasn't visibly affected at all. One Steve Limit: Called "The Ugandan Headhunter" because of the presence of Andre The Giant, but it worked as an example of a Name to Run Away from Really Fast. Papa Wolf: Toward anyone who threatened his managers. Devastation Inc., led by General Skandor Akbar in WCCW and Mid-South/UWF. The Dungeon of Doom in WCW. The International Squad of Terror in the late 1990s's version of NWA Mid-Atlantic. Retcon: Made his WWE debut in 1984 managed by "Classy" Freddie Blassie, and they appeared together on "Piper's Pit" on the August 25th (taped July 30) episode of WWF Championship Wrestling. During his second run, in 1986, he, the Wizard (King Curtis Iaukea) and Kim Chee (Steve "The Brooklyn Brawler" Lombardi) appeared on Piper's Pit on the November 22 (taped October 28) WWF Superstars, and Piper had to act like he had never seen him before. But then, every time Kamala returned it seemed like his previous runs with the company were forgotten. Ring Oldies: Started in the late 1970s and competed in independents up until a few years ago. Scary Black Man: As the Mississippi Mauler. Screw This, I'm Outta Here! : Left WCW in October 1995 right before the Halloween Havoc PPV out of frustration with not getting paid. Squee! : Just listen to the crowd's delight in this old Mid-South clip of Kamala beating up on a young Shawn Michaels as he and manager General Skandor Akbar throw various referees out of the ring and Kamala beats up on whoever tries to save Shawn until Terry Taylor is able to take out Friday. Stout Strength: One of the few men to slam Andre, doing the deed in Mid-South. Take That! : His song "Push It," where he slams WWE's Wellness Policy as a sham and bashes Pat Patterson, the Brooklyn Brawler, Hulk Hogan and the Ultimate Warrior, among other targets. Tribal Facepaint/Body Paint: His are some of the most recognizable of wrestling's last 30 years. Uganda Doubling: The vignettes introducing him on the CWA's TV show were filmed in Jerry Jarrett's backyard. The Voiceless: Rarely spoke intentionally while in character, since he wasn't supposed to be able to speak English, thus providing work for his various managers, though at times something beyond grunts and screaming came out, such as when he shouted "HEY REF!" during a match with Lawler at a Jersey All Pro Wrestling event on January 18, 2003. What makes it funny is the name of the event: Actions Speak Louder Than Words. There is a famous interview from his WWE days in 1986 with Kamala, Sika, the Wizard, Kim Chee and "Mean" Gene Okerlund where Kamala is grunting and Sika is speaking Samoan and Gene asked if they were actually communicating with each other. THE WIZARD: "THEY COMMUNICATE ON THE HIGHEST FORM, WHICH IS THE 39TH LEVEL, AND THE MORE COMFORTABLE YOU GET WITH US, MEAN GENE, YOU WILL BE ON THE 41ST LEVEL!" Averted in the documentary Card Subject to Change, where he is interviewed in full makeup and sings in the ring. Wrestling Doesn't Pay: Sadly, a Real Life example. Also sad because he has cited Money, Dear Boy as his motivation for getting into wrestling in the first place.